The Clash, a highly popular punk band from the 80s had a big hit with “Should I Stay or Should I go,” a tale of indecision where a guy who can’t seem to figure his girlfriend’s wishes for the evening begs for clarification of his dilemma. Welcome to the current stock market where investors are experiencing a daily intraday whipsaw as traders, human and algo, try to figure out whether the political stalemate in Washington is more meaningful to asset prices than the fact that the global central banks are not likely to raise interest rates anytime soon. Historically, we seem to be at that inflection point in the economic cycle where a slowing economy is supposed to affect corporate earnings and the market is looking to the Federal Reserve to lower interest rates. Certainly the central bank of China has begun an easing cycle which is having a positive effect on stocks in the Pacific Basin and Asia in general. This is being reflected in the generally positive action in emerging market ETFs (EWZ, EWA, EWM). This brings me to the final leg of the proverbial stool, the trade spat between China and the U.S. Indeed, this seems to be the most important factor at the moment, at least based on the fact that the robot traders buy the market on positive trade headlines and do the opposite when the news on the situation is negative. All of this makes me wonder if we are not witnessing a mirror image/complete reversal of the October bear market, especially since last week started on a down note but the “buy the dip” crowd resurfaced in a big way. Indeed, the only thing we know so far is that there has been aggressive money flow into biotech (IBB) and the semiconductor stocks such as TXN, AMAT, and MU, which hit the afterburners last week. 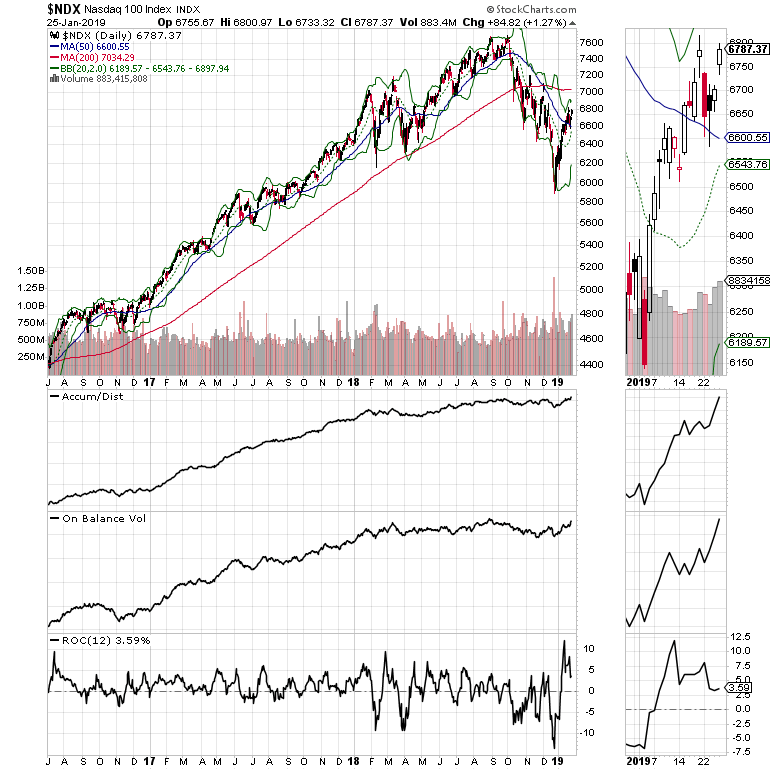 Nowhere was the market’s indecision and tendency toward volatility more visible last week than in the activity of the New York Stock Exchange Advance Decline line (NYAD) who’s uncanny ability to predict the general trend of the market has been unrivaled since the 2016 presidential election. As the NYAD chart clearly shows, activity that had been range bound led to a breakout to the up side as the 200-day moving average for NYAD seems to have now become support rather than resistance. If this particular technical factor is not reversed, the odds favor higher stock prices over the next few weeks and perhaps longer. 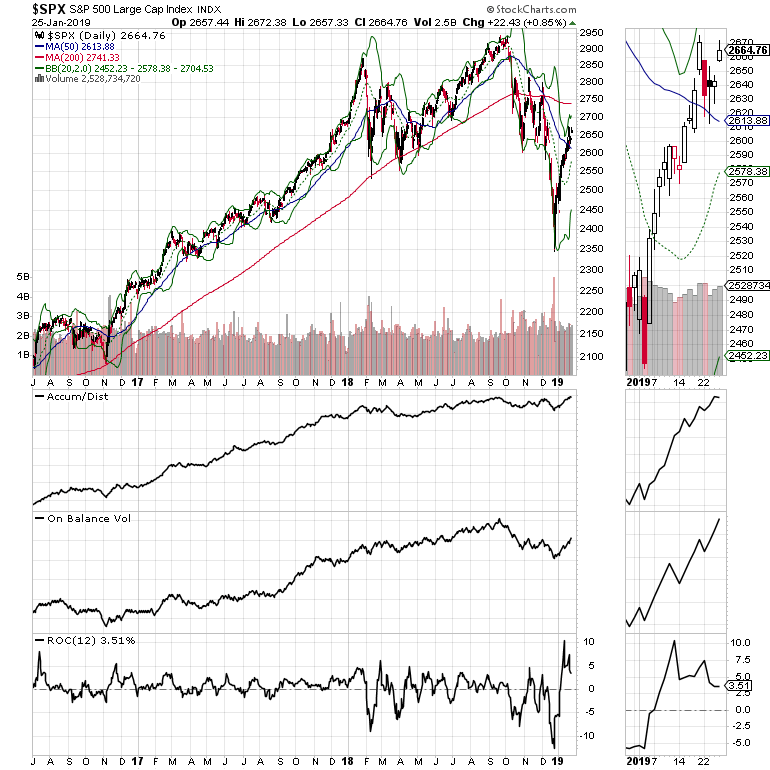 Both the S & P 500 (SPX) and the Nasdaq 100 (NDX) indexes reversed the weakness they displayed earlier in the week and closed just below their recent January 2019 highs. Both indexes have crossed above their 50-day moving averages and seem to be setting up for a test of their 200-day moving averages. However, the Accumulation Distribution (ADI) and On Balance Volume (OBV) indicators suggest that money is moving aggressively back into the market. This confirms the positive action in the NYAD. Thus until proven otherwise, the burden of proof has once again shifted to the bears as the algos and the hedge funds seem once again to be buying every dip. In this market the trading action is more than ever dependent on headlines and the way robot traders respond to those headlines. This is a mixed blessing of sorts as it creates volatility on an intraday basis and volatility creates opportunities for the nimble. 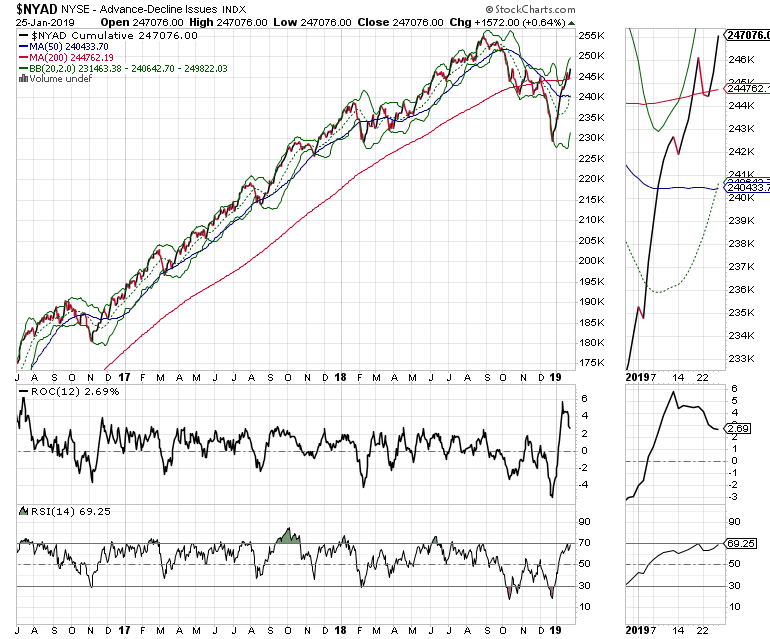 But taking a more macro perspective, it’s clear that the algos will accelerate the major trend in the market. And that trend, at the moment is up as the lure of easy money is again becoming a money magnet for stock traders. Therefore those who trade for a living are more likely to survive if they keep the general trend of monetary policy in mind. It may also be useful to use trading targets and sell stops for profit taking and to consider moving more assets into day trading or shorter term strategies. By following these simple tenets traders could stay for a while and go while the getting is still good. More than anything stick with what’s working: emerging markets, biotech, and tech. I own EWM, EWA, and EWZ as of this writing.